This is the 4 inch by 4 inch version our handmade Cypress Tree tile. This size will be a natural fit in many tile installations that utilize standard 4 inch by 4 inch tiles. This design is also available in the 2"x2" size, and a very similar design is available in two rectangular sizes: 3"x6" and 4"x8". Cypress trees occur naturally along the banks of rivers and other wet areas, but some varieties can grow on dry land as well. 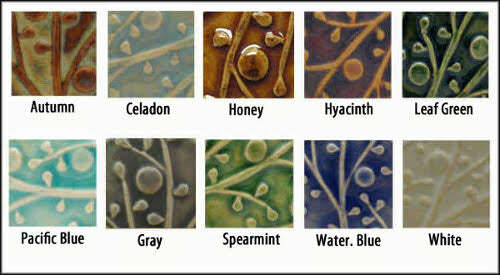 The Cypress tile is available in different glaze colors, all of which are lead free and dinnerware safe. The Cypress tile can be installed in walls, and will add a handmade Arts and Crafts touch to kitchens, bathrooms and fireplace surrounds. This tile can also easily be hung on the wall using a nail or screw. This stoneware Cypress tile is an original design, sculpted in relief and reproduced by the artist, by hand.